During the heyday of the pulps, imitation was common. Create a character who is commercially successful and there would soon be seemingly dozens of similar characters popping up at the newsstands right next to your guy. Tarzan of the Apes was, of course, one of the most successful characters to appear in the pulps. So he soon had his imitators: Tam, Son of the Tiger; Morgo the Mighty; Jan of the Jungle; Kioga, the Snow Hawk; Kwa of the Jungle; Jongor; Ozar the Aztec; and many others. The stories in which these Tarzan clones appeared vary wildly in quality, but some of them are really quite good. The best of the lot was probably Ki-Gor, the Jungle Lord. Ki-Gor was an infant when his missionary father is killed, forcing the young lad to grow up in the jungle and learn to take care of himself. As an adult, he rescues the beautiful socialite Helene from several dangers after her plane crashes in the jungle. The two, of course, fall in love and Helene leaves high-society behind for a life in Africa. And, though there are elements of the sort of racial stereotyping common in the fiction of the day, several regular supporting characters—both African natives—are presented as brave and intelligent men, equals to Ki-Gor in just about every way. Tembu George, leader of the warrior Masai tribe, and N’Geeso, chief of a pygmy tribe, are Ki-Gor’s best friends, accompanying him on his adventures and fighting at his side. They are both fun characters, with both regularly getting their own Crowning Moments of Awesomeness throughout the series. 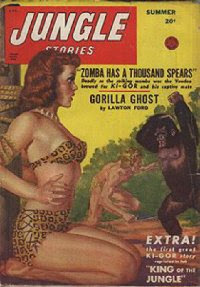 A recent issue of High Adventure magazine reprinted two very entertaining Ki-Gor stories from 1948. One of them involves a old man who controls a pack of large and vicious dogs, using them to terrorize a local tribe as a part of an insane scheme to take revenge on an old enemy. With him are his two beautiful daughters, one evil and the other merely almost evil. After several fights, captures and escapes, Ki-Gor and Tembu George lead the Masai against the old man’s forces. There’s a wicked twist at the end involving the not-quite-evil daughter. The other tale involves yet another not-quite-evil jungle girl, this one raised by gorillas and now determined to use a primate army to take revenge on men after having been briefly captured by slavers. This one contains several exciting and well-described action scenes, including a one-on-one fight between Ki-Gor and a large gorilla. The best “Jungle Lord” stories are still the original Tarzan novels, but Ki-Gor does all right for himself, using the Tarzan template, but infusing his adventures with his own individual style and personality. Spidey has been taking out crooks and burglars without working up a sweat and starts wishing he’d come across an opponent who presents more of a challenge. 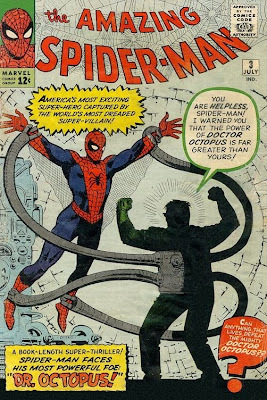 But his first encounter with Doctor Octopus results in Doc Ock pretty much beating the snot out of him. So Peter Parker has a crisis of courage, wondering if he ever dares put on his Spider Man costume again. 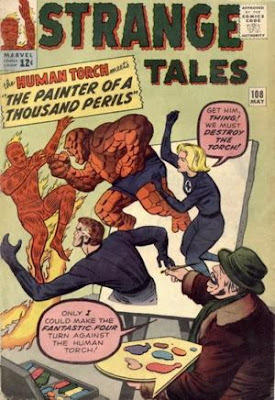 A little later, though, the Human Torch gives a speech at Peter’s high school about never giving up. Inspired, Peter does indeed don his costume, taking on Doctor Octopus and this time winning the fight. This is yet another great issue for a variety of reasons. First, it introduces us to another classic villain in Doctor Octopus. Artist Steve Ditko does a wonderful job choreographing the final fight scene. Peter’s mental crisis was believable for someone still brand new at the superhero game and perfectly in character for Peter. It’s interesting that Peter’s first encounter with the Human Torch involves an inspirational speech. In the future, their occasional team-ups will involve trading insults and getting on each other’s nerves (making for one of the most consistently entertaining “friendships” in the Marvel Universe). Also, J. Jonah Jameson is suddenly the publisher of the Daily Bugle instead of (or in addition to?) Now magazine. I presume that Stan Lee and Steve Ditko realized that Peter’s news photographer bit simply made more sense if he was working for a daily newspaper with a constant need for new material. Loki is up to his old tricks again. This time, he tricks Thor into bashing himself with his hammer in the exact spot to affect his “chromosomatic gland.” This changes Thor’s personality from good to evil. Thor and Loki team up, rampaging across Earth, destroying famous monuments and threatening to do more damage unless Odin surrenders Asgard to them. 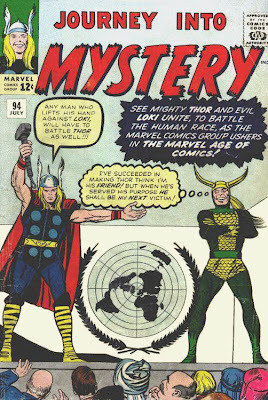 Fortunately, Odin has that all-wise thing going for him and manages to arrange for Thor’s hammer to deliver a second whack on the “chromosomatic gland,” reverting Thor to normal. 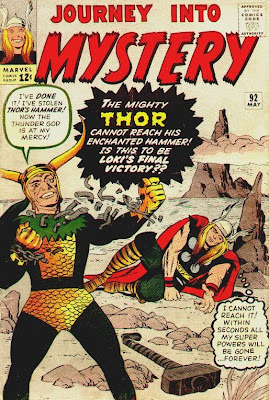 Loki is recaptured, the Asgardians repair all the damage and Odin wipes the memory of “evil” Thor from mankind’s memory. It’s all just a little too silly, failing to maintain the suspension of disbelief that superhero stories require to really work. And that whole world-wide memory wipe at the end is just a little too much of a dues ex machina. All the same, it’s nice to see that the Asgardians are still playing more and more of a role in the stories as the series progressed. We’ve gotta look at two stories from Strange Tales this time around. 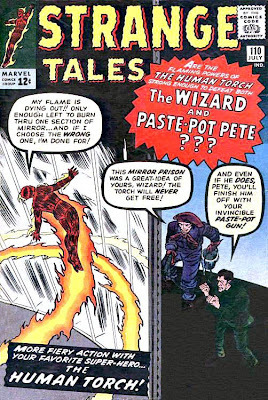 First, the Human Torch: Two of his enemies, Paste-Pot Pete and the Wizard, team up to get revenge on Johnnie. They at first try to frame him for their crimes, then later lure him into a trap. Johnnie manages to come out on top, though. Paste-Pot Pete’s visual design holds the story back a little. Until he changes his name and costume, he’s just not going to look that dangerous. But there is some fun interaction between him and the Wizard as he grows increasingly annoyed by the other villain’s pomposity and the story itself is reasonably good. There’s a nice bit that plays on the fact Johnnie doesn’t have a secret identity—when news reports seem to indicate that the Human Torch might be guilty of a crime, the other students at Johnnie’s high school begin to shun him. This series will never be noted for its characterizations, but it manages a very human moment this time around. Second, we have Dr. Strange: The first Dr. Strange story doesn’t give us his origin. Instead, he’s already established in his Greenwich Village mansion, acting as the go-to guy for any one in danger from a mystical source. In this first story, he has to enter the dreams of a man being tormented by nightmares. Once “inside,” he encounters the being called Nightmare. Strange has to telepathically call upon his mentor, the Ancient One, for help, but manages to escape the dream world in the nick of time. We’ll get Dr. Strange’s origin in a few months time, but this initial story really works better with a still-mysterious protagonist. Steve Ditko will prove to be the perfect artist for the series, providing wild designs for the extra-dimensional locations and creatures that Dr. Strange will be regularly encountering. It’s a strong start for what will be some very entertaining and imaginative tales. That’s it for July 1963. August will see the Fantastic Four continuing their latest battle with Dr. Doom; Ant Man and Wasp will take their turn fighting off an alien invasion; Thor will fight an evil duplicate; Iron Man will do a little time traveling; Dr. Strange will fight Baron Mordo for the first time; and the Human Torch will battle yet another villain in a silly costume. A lot of Shadow episodes begin as if there’s some sort of supernatural element involved (usually ghosts), but then turn out have a “rational” explanation. Sometimes, the spooky bits at the beginning are done so well, that the explanation at the denouement can’t help but be a little disappointing. 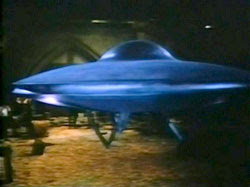 A 1940 episode titled “Ghost Town,” for instance, begins with the apparently supernatural happenings around an abandoned Western town that Lamont and Margo are visiting. It all turns out to be a plot by a gang of thieves to keep people away from their hide-out. The resolution is perfectly good storytelling, but it was a lot more fun when the effectively done hauntings at the beginning of the episode were seemingly without explanation. But “Murder at Dead Man’s Inn” remains strong the whole way through, even when the “ghost” that Lamont and Margo encounter is explained away. The spooky stuff is really, really spooky—a “dead man” with a knife through his heart is still walking around while he provides room service for several corpses stashed away in various rooms of a remote inn. Eventually, Lamont figures out what’s really going on. It’s all a plot to uncover the location of an old pirate treasure. But the story loses none of its effectiveness even after we find out the ghost is a fake. The shift in thematic focus is done so smoothly (and the basic plot of finding a pirate treasure is so inherently fun) that the episode remains solidly entertaining from start to finish. Margo may have not have that much fun—at one point she’s held hostage with the villain threatening to hurl her out a window and off a cliff—but the rest of us have a fine old time. The first radioactive mutant ever? 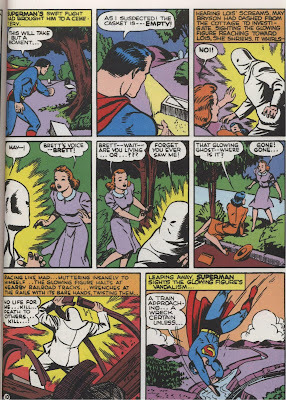 I was reading a reprint of Action Comics #39 (August 1941) and, lo and behold, the story involves a guy mutated into an invulnerable killing machine by nuclear radiation. Now after World War II, comic book characters mutated by radiation were common as dirt. A lot of the B-movies of the 1950s also used this idea. It was an incredibly convenient plot device--a quick way to explain how Godzilla was awakened after a multi-million year slumber; or why there are giant ants rampaging through the desert; or why Peter Parker suddenly has the proportional strength of a spider. But before the war, when the average person was only vaguely aware of what radiation is, it didn't pop up as much. So it was interesting to run into the concept in a pre-war story. So I've been wracking my brain trying to think of an earlier story in any medium that used the radioactive mutant conceit. I can only think of one that kinda, sorta qualified. A pulp magazine hero called the Green Lama first appeared in 1940. One of his tricks was drinking a solution of radioactive salt. This temporarily gave him the power to shock bad guys unconscious simply by touching them. But that really isn't the same thing as a mutation into something monsterous or superpowered. Was this Superman story the first time this happened? I just don't know for sure. There might be a B-movie or something from Astounding Stories magazine that covered this ground first. Or there might not. It's one of those questions that there's really no effective way to research. But whether it was a first or not, the Superman yarn (recently reprinted in The Superman Chronicles, volume 6) is a pretty good one. With a good script by Jerry Siegel and good art by Leo Novak, it makes for an effective and slightly creepy horror story. Another bout of shameless self-promotion. There's yet another article I've written posted at www.otrcat.com. OTRCat, by the way, continues to be a great source for Old-Time Radio episodes. In addition to getting discs of specific shows, I've always enjoyed the discs you can get featuring specific actors. The Boris Karloff, William Conrad and John Dehner collections are particularly noteworthy. 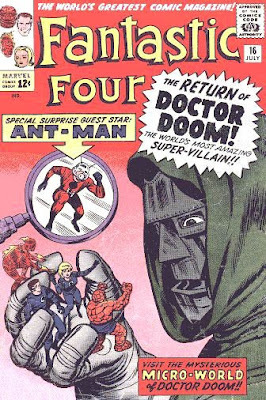 The last time we saw Dr. Doom, he was hit by a shrinking ray and apparently shrunk down into nothingness. Now we find out he entered a sub-atomic world and managed to set himself up as ruler, imprisoning the rightful king. Now he’s using his scientific skills to toy with the Fantastic Four, shrinking each of them down (then enlarging them again) at random moments. Unaware at first of who is behind all this, Reed calls on Ant Man for assistance. One thing leads to another and the FF (and Ant Man) soon find themselves also reduced in size yet again, prisoners of Doom on the subatomic world. There’s several strong points to the story. It’s fun to see the Fantastic Four once again interacting with another Marvel hero. Lee and Kirby have fun with scale—the FF is shrunk down to enter the subatomic world, then shrunk again so that Doom and his guards are relative giants. This leads to a fun fight scene in which a tiny Fantastic Four is beating up some “giant” guards. Later, Sue gets yet another moment of glory in which she comes up with the idea for how to escape a death trap. These last few issues, she’s been doing pretty good. There’s an interesting character moment for Ben during the story. At one point, Reed figures out a way to turn Ben human again, but Ben’s no longer sure he wants that. His girl, Alicia, likes him as the Thing and he may now be content with his lot in life. At the climax, Doom’s power in the tiny world is broken and he enlarges himself to normal size to escape. So next issue, his latest battle with the Fantastic Four will continue. The evil scientist Egghead is back to take revenge on Ant Man. 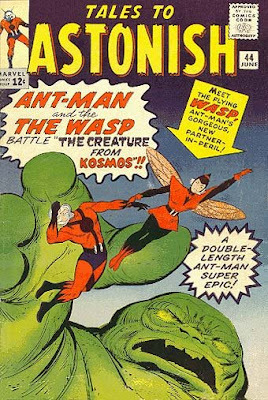 He captures the Wasp in order to lure Ant Man into a trap involving—among other things—an anteater. It’s not a bad story, though Egghead is still visually uninteresting and doesn’t really come close to being as cool as, say, Doctor Doom. 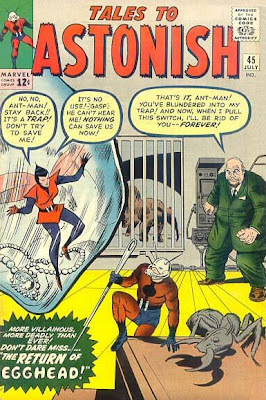 Ant Man continues to suffer from a lack of interesting villains. 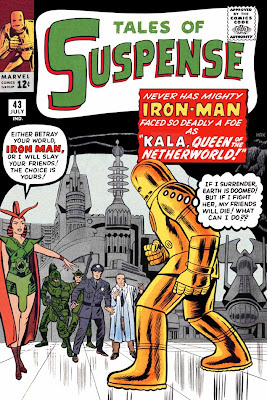 Tony Stark and a couple of his employees are kidnapped and taken to the underground empire of Kala, Queen of the Netherworld. This subterranean civilization, all that remains of ancient Atlantis, is planning an invasion of the surface world to reclaim it for themselves. They want to force Tony to come up with a way to transport their super-weapons to the surface, threatening to kill the other hostages unless he cooperates. In a situation parallel to Iron Man’s origin, Tony pretends to help long enough to build an Iron Man suit. This leads to a pretty good fight scene, though Iron Man’s victory over Kala’s super weapons seems a little too effortless to be truly satisfying. Also, this issue highlights the lack of regular supporting characters—the hostages are pretty much just nameless Red Shirts. But, as usual, Jack Kirby comes up with some neato character and gadget designs to populate the underworld city. Well, actually, the device Iron Man uses to dig back to the surface is a rare case of a Kirby illustration looking silly—it basically looks like a pair of oversized hedge-clippers rather than some sort of cool piece of super technology. Oh, well, some of these problems will be solved soon. Regular supporting characters will join the cast in a few months and Iron Man will gradually become much more visually appealing. Next week, we’ll finish up July as we see what Thor, Spider Man and the Human Torch are up to. Also, we’ll meet yet another addition to the Marvel pantheon of heroes. Vincent Price is best remembered as a horror movie icon, playing larger than life and characters in countless scary films. But he was a great actor with a wide range, as it demonstrated weekly on radio when he played Simon Templar, alias The Saint. This was a clever and pleasurable show, giving us solidly plotted mysteries during which Simon could suavely spout off countless one-liners and witty comebacks while investigating yet another murder. In this episode, he’s approached by a man named Potts, who confesses to having just killed his partner in a jewelry business in self-defense. But the body has disappeared and the police don’t believe Potts’ confession. So he asks Simon to prove his guilt. This is odd enough, but when the supposedly dead partner shows up quite alive at Simon’s apartment, it gets downright bizarre. Soon, someone really is murdered. Potts’ young, beautiful wife and a stoic butler are tossed into the mix. But Simon meets it all without losing his natural cool and soon has the whole thing figured out. Like all the best Saint episodes, this one is both funny AND a good mystery. (I love the part where Simon asks Potts "Do you have any enemies?" and then--without missing a beat--adds "Are you married?") The writers never let the humor get in the way of good storytelling (or visa versa), giving us one of the most persistently entertaining old-time radio shows. It’s always a little dangerous watching a movie you liked as a kid but have never seen as a grown-up. You never know when you might ruin a fond memory by discovering what you once thought was cool turns out to be lousy storytelling when seen through adult eyes. As mentioned in an earlier post, I took this chance when I watched Disney’s The Scarecrow of Romney Marsh. This paid off—as the movie turned out to be super-cool no matter how old its audience. I took the same chance again when I watched a little-known science fiction film from 1968 titled The Bamboo Saucer. I saw it on a Saturday afternoon “Creature Feature” when I was about 13 years old. I still remember enthusiastically recounting the story to some friends at school that Monday. Heck, it had everything from a flying saucer to a desperate last-stand gun battle against the Red Chinese army. How cool was that? Well, I’ve now seen it as an adult and, while it’s not as cool as The Scarecrow of Romney Marsh, it still holds up as an entertaining attempt at combining believable science fiction with cold war shenanigans. A flying saucer has landing in a remote area of China. The crew dies (presumably from Earth bacteria), but the ship is intact. The Chinese government doesn’t know about it (it’s well-hidden inside the roofless, abandoned church where it had landed), but an American agent gets word of it back to our government. Soon, a small team of scientists and a test pilot parachute in to examine the craft. It’s too much to hope that they can figure out how to fly it, but they plan on studying it for as long as they safely can, then destroying it to keep it out of the hands of the Reds. But a Russian team (including—not surprisingly—a hot blonde lady scientist) has entered China with pretty much the same plan. Both teams reluctantly team up to examine the craft. But can they learn to trust each other—or will they end up killing one another to possess an incredible new technology? It’s all done reasonably well, with some talented character actors (including Dan Duryea, Bob Hastings, Bernard Fox and James Hong) bringing life to some otherwise one-dimensional characters. The tension comes from both having to hide out from the Red Chinese and worry about the two groups double-crossing each other. I really liked a number of different elements of the film. Duryea’s character—the military commander of the American group—is very reluctant to trust his Russian counterpoint (the feeling is mutual). But he’s not presented as a jingoistic or bull-headed jerk, just as a man who is loyal to his side. I liked that the science fiction elements were believable, both in the explanation of how the saucer worked and in the problems run into during an unintentional trip in the saucer through our solar system. I liked that the scientists were allowed to act smart, gradually figuring out bits and pieces of an alien technology, but never getting quite enough of it right to make flying it a safe thing to do. I liked that the finale pretty much depends on one character doing complex math quickly and coming up with what is hopefully the answer needed to save three lives. I liked some little touches—whenever the saucer is powered up, its hull briefly becomes magnetic. The Russian C.O. always painfully holds his mouth when this happens because he’s got metal caps on his teeth. Later, when the saucer has taken off on its trip through the solar system, one of the scientists is methodically opening and closing circuits to try to get the vessel off auto-pilot. When he hits the right sequence, it makes a panel he didn’t know about snap open and thus gets whacked on the head. Both these events are small details, but I thought they helped add verisimilitude to the plot. There’s also a truly funny line early on in the film. Just before parachuting into China, one character wonders aloud why he’s there. “Because you’re the most expendable brilliant electronics expert we could find,” he’s told. 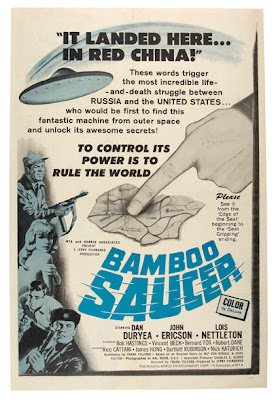 At least one on-line review I found thought The Bamboo Saucer was a bit racist, since it shows the Red Chinese as hard-core bad guys, but showed the Americans able to form a détente with the Russians. I disagree, though. This movie was made smack dab in the middle of the Cultural Revolution, during which the Chinese Government (always a brutal entity) was being particularly oppressive and violent. 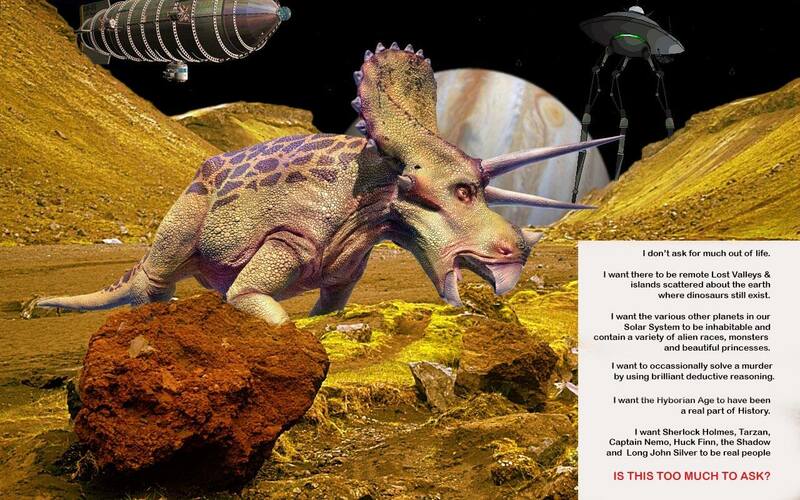 Keeping them from getting advanced alien technology was a perfectly sensible thing to do. Besides, there are elements to the movie that differentiate between an evil government and the average people being oppressed by it. The film’s very, very small budget shows a few times. The most notable instant is during the last stand battle near the climax. At one point, the good guys toss a volley of hand grenades at the attacking Chinese soldiers. The montage of explosions that follow re-uses the same shot of a particular explosion knocking down some soldiers at least five times. But that fight is otherwise a fairly tense and exciting set piece. The rest of the movie was good as well. Though I’m not as knocked dead with the movie’s awesomeness as I was when I was 13, it was still well worth revisiting. Thor puts a stop to a Red Chinese invasion of India. This puts the Chinese in a snit and a scientist named Chen Lu is ordered to come up with a way of destroying the Thunder God. Chen’s plan involves using his own body to absorb huge amounts of radiation. This makes him pretty much invulnerable and he’s soon standing in the streets of New York City, threatening to “blow up like an H-bomb and take the whole city with me” if Thor doesn’t surrender to him. 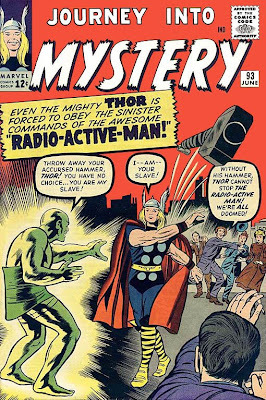 Thor eventually manages to call up a whirlwind that tosses the Radioactive Man back to China before he explodes. The Radioactive Man will be back, though—yet another of the many, many reoccurring super-villains that will eventually populate the Marvel Universe. Like Thor, Iron Man is busy catching Commies, rounding up a trio of spies on a ship in New York Harbor. Meanwhile, yet another Communist agent—a master of disguise called the Actor—manages to steal the plans for Tony Stark’s new disintegrator ray. He also stumbles across a clue that tells him Tony Stark and Iron Man is the same person. Iron Man pursues the Actor back to Russia to recover the plans. The story takes an ironic turn at this point, as Tony briefly impersonates the Actor and the Actor’s knowledge that Tony is Iron Man ends up working against the enemy agent. It’s more a spy story than a super hero tale, but it’s a fairly well-constructed spy story with a nice twist at the end. A grouchy old hermit who lives near Glenville is really a sorcerer who has figured out how to re-open Pandora’s Box and gain control of all the evils inside. This lets him do stuff like release Hatred into a bank, getting everyone to fight each other while he loots the place. Then he releases Forgetfulness so that no one remembers what happened. Johnny figures out who is behind the weird crime wave and manages to figure out a way to trick the Sorcerer and get the box away from him. A bad guy using Pandora’s Box as a weapon is actually a pretty good idea, especially with Jack Kirby doing some typically cool designs of the various thingies that pop out of the Box. There’s even a panel towards the end that gets quite creepy—showing us two policemen in danger of laughing themselves to death after being “infected” with Foolishness. Overall, this issue shows just a little bit more cleverness and innovation than we normally expect to see in one of Johnny’s solo gigs. That’s it for June 1963. July will be a pretty busy month as we see a bunch of villains returning to seek vengeance against several of our heroes. Doctor Doom will again menace the FF (who get a bit of help from Ant Man); Loki will again make Thor’s life difficult; Egghead will return take revenge on Ant Man; while the Wizard and Paste Pot Pete will team up to take on the Human Torch. Also, Iron Man will take a trip to an underground kingdom; Spider Man will get the snot beat out of him by a certain multi-armed arch enemy; and the Marvel Universe will gain a Sorcerer Supreme in the form of Dr. Stephen Strange. Will the real Flashgun Casey please stand up? … That’s how it was. Day after day. Picturing the contemporary drama of life but never thinking of it that way; thinking of it only as a job he liked and always knowing one thing: if you got a picture, no one could ever deny it. Stories could be faked but to get a picture you had to be there. That’s from the 1942 novel Silent are the Dead, by George Harman Coxe. It’s a good, concise description of Jack “Flashgun” Casey, the tough, hard-drinking, Boston-based news photographer who was the protagonist in an excellent series of stories in Black Mask magazine during the heyday of the pulps. Casey’s tougher traits, though, are balanced out by some other qualities—his intense loyalty to his friends and his profession and his empathetic nature. It’s these qualities in Casey that make him an effective hard-boiled hero. The best stories from that genre combine a cynical world-view with the knowledge that there actually is a difference between right and wrong. The protagonist, by upholding his code of honor, would give the stories a moral backbone that raised them to a level they would not have otherwise reached. The code was often a very personal thing, centering around keeping one’s word or an unflagging loyalty towards something worthwhile. It reminded us that, though we might be up to our hips in corruption, we were each still individually responsible to hang on to our own moral worth. Casey, who was always reluctantly being pulled into criminal investigations when all he sets out to do is get a good picture, is just such a protagonist. The Casey stories had great plots as well. Silent are the Dead involves several murders, a a blackmail scheme and assorted convoluted motives, all twisting together into an emotional ending. The short story “Once Around the Clock” has Casey helping out a drunken and (seemingly) worthless ex-con who is falsely accused of murder. In “Two-Man Job,” Casey takes a picture that links armored car guards to a robbery and murder plot. All great stuff, written in straightforward prose that moves the stories along at a fast pace. But when Casey came to other media, he was never quite the same guy. A 1936 film titled Women are Trouble (based on a short story of the same name) has never shown up on DVD, so I’ve never had a chance to see it. But a 1937 Casey film, titled Here’s Flash Casey was recently released on disc. In this film, Casey reverts from being an experience photographer to a young guy just out of college, hoping to get a job at a big newspaper. The film doesn’t try to replicate the hard-boiled feel of Coxe’s stories at all, but instead goes for the sort of fast-talking, wise-cracking style seen in better known films such as The Front Page. Its loosely structured plot follows Casey through his struggle to get a job and his pretty much unintentional involvement in breaking up a blackmail ring. Judged on its own merits, it’s not a bad film—the main characters are likable and a fair percentage of the wise-cracks are pretty good. But this particular Casey just isn’t the same guy we come to like so much in Coxe’s original stories. Yet another Flashgun Casey had quite a long career on radio. 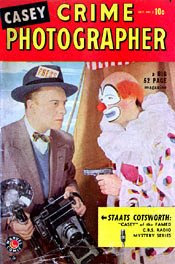 Running from 1934 to 1950 (then again from 1954-55), Casey, Crime Photographer gave Casey a regular partner (pretty reporter Ann Williams) and cast him in the mold of a traditional amateur detective, with a talent for deductive reasoning that was often as useful to him as his skill with a camera. Once again, the tough, hard-boiled aspects of the character were left behind, though the guy we are left with was amiable enough and the individual episodes were well-plotted mysteries. It was a solid, enjoyable show, but once again, it gave us a Casey different from both those who had come before him. There’s one more version of Casey out there I’ve never had a chance to see. He briefly appeared on television in 1951-2 in a live show starring first Richard Carlyle and then later Darren McGavin. Like the movie Women are Trouble, this show has never been released on DVD and I’m uncertain if many episodes still exist. I’d love to see how McGavin (a wonderful character actor) played Casey. Oh, well, perhaps someday. Every time Casey appeared in a new medium, he was born anew, going from tough guy to college kid to clever amateur detective. The Casey from Coxe’s original stories is still the best of the lot, but all of them are worth getting to know. The prose stories, the movie and the radio show each in their own way present us with entertaining stories and a likeable hero. 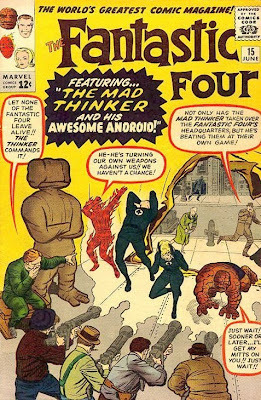 This issue introduces us to the Mad Thinker and his Awesome Android, a pair of villains who will become regular members of the FF’s Rogue’s Gallery. The Thinker’s shtick is pretty much just being really, really smart. 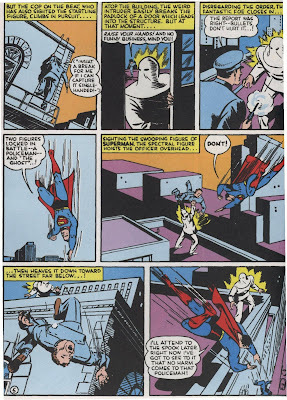 As a precursor to taking over New York City, he figures out a way to manipulate the FF into temporarily breaking up, then uses a power outage to gain entrance into the Baxter Building. Once there, he equips a small army of gangsters with advanced weaponry invented by Reed. He also uses Reed’s notes on DNA research to create the powerful (and visually cool) Awesome Android. In a nice series of vignettes that manages to generate some real emotion without getting too corny, Reed, Sue, Ben and Johnny all soon realize they miss each other. But when they return to New York and get back together, they find themselves locked out of their own headquarters. In yet another fun Jack Kirby action sequence, the four heroes have to work together to bust into the building and defeat the Thinker, the Android and the ray-gun-wielding mobsters. It’s all very well-choreographed—each of the four (even Sue) is given something useful to do. And, of course, the Thinker meets his final defeat because it turns out that Reed Richards is even smarter than he is. Hank’s got a girlfriend!!! Hank’s got a girlfriend!!!!! We actually get some back story on Henry Pym in this issue, with a flashback that tells us he was once married to a girl named Maria. Maria was from Eastern Europe and she had defected to America. But soon after she and Hank are married, Communist agents kidnap and kill her. Back in the present, Hank is feeling lonely and missing his wife. He also realizes he’s had too many close calls and needs a partner to back him up while he’s fighting the bad guys. Well, as luck would have it, he soon meets Janet Van Dyne, who reminds him of Maria AND is anxious to avenge the recent murder of her father by an alien being. So Hank implants tiny wings in her shoulder blades that will sprout whenever she uses the shrinking gas. And thus the Wasp is added to the pantheon of Marvel heroes. She and Ant Man team up to whip the murderous alien. Janet’s addition to the cast is a step up for the Ant Man stories. Hank had gone far too long without a supporting cast and Janet proves to be a nice fit for him. The two are soon falling in love with each other, with Janet’s free-spiritedness providing a nice balance for Hank’s more staid personality. The two really never grow into strong enough characters to make their solo stories as memorable as those we see in the Fantastic Four or Spider Man, but they do eventually become an important and engaging part of the Marvel Universe as members of the Avengers. Next week, we’ll finish up June 1963 with a look at what Thor, Iron Man and the Human Torch are up to. One appeal of historical mysteries is that they boil the genre down to its basics. In an historical mystery, there’s no access to advanced science. No DNA—no fingerprints—no testing for gunpowder residue. The detective investigating a crime has only his wits and good, old-fashioned deductive reasoning to help him catch the guilty and help the innocent. One of the best-known and most successful historical mystery series is Ellis Peters’ Brother Cadfael books. Set in 12th Century England, the series plops its hero into a series of complex and intriguing mysteries. Cadfael is a fun character—a former soldier and sailor who entered the Benedictine order late in life. Now he is steward of the monastery gardens near the town of Shrewsbury. And when villainy raises its ugly head, Cadfael uses his brains, his exceptional powers of observation and his keen appreciation of human nature to help figure out who committed what crimes. St. Peter’s Fair (1981) is a fine example of the series. The fair is an annual event that brings a lot of merchants (and hence a lot of money) to Shrewsbury. But, with the town still recovering from getting caught in the middle of a recent civil war, the townspeople and the monks disagree about who should profit from the tolls and levies. This leads to a small riot. Soon after that, a merchant is found stabbed to death. Initially, the evidence seems to point to the son of one of the town leaders. But Cadfael and his friend, deputy sheriff Hugh Beringar, have their doubts about that. What follows is a very well-constructed mystery. Clues are gradually found as several other crimes—including another murder—occur and Cadfael is eventually able to put everything together into a solution that seems to explain everything. But has he done so soon enough to prevent yet another killing? Medieval England is a neat setting for a mystery series to start with. The fair creates a plausible reason for bringing different characters together and creating motives both mercenary and political that might explain the crimes being committed. Adding to the strong plot is the fact that Cadfael is the world’s nicest guy—a man who understands that service to God includes service to his fellow man and a deep desire for justice. He’s one of the genre’s most appealing heroes and his presence at St. Peter’s Fair makes the place well worth a visit. Next time, we’ll jump into some hard-boiled adventure with Dashiell Hammett's two interlocking short stories "The Big Knockover" and "$106,000 Blood Money." Loki is up to his old tricks again, managing to magically draw Thor’s hammer up to Asgard as part of a plan to lure the Thunder God into a trap. Thor has to fight living trees and a big dragon-like beastie, fashioning replacement hammers out of wood and stone while he does so. Eventually, he gets the best of his evil half-brother. No one has ever matched Jack Kirby at his prime as an artist on Thor, but Joe Sinnott does a fine job this issue (as he did last issue) giving us imaginative visuals. The pacing of the story is a bit off—there’s a few too many pages of Thor dealing with mundane crooks and providing special effects for a movie (in exchange for a donation to charity) before the real action gets started. But the fun parts still manage to outweigh the story’s faults. The main plot of the story here is a mad scientist named Dr. 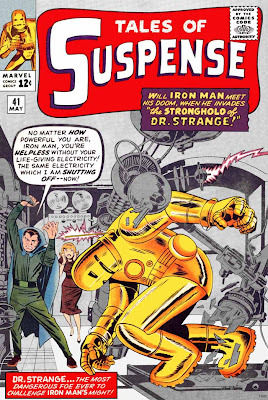 Strange attempting world-wide nuclear blackmail, while remaining protected by a force field on his private island. Iron Man puts a stop to this, of course, but not before Dr. Strange’s estranged daughter saves him by tossing him a couple of flashlight batteries (with which to recharge his armor) at a key moment. Dr. Strange manages to escape, but I don’t believe he ever reappears. His name, after all, will be co-opted by a good guy in just two months. It’s an okay story, but what’s most interesting about this issue is that the first five pages (over a third of the story) is pretty much just a review of who Tony Stark/Iron Man is. 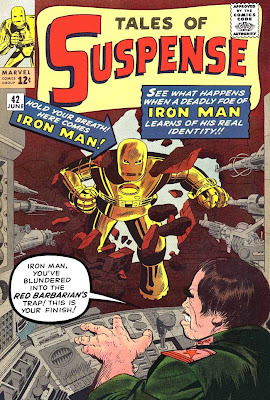 I’m assuming that Stan Lee was worried that new or infrequent readers of Tales of Suspense would not yet know who Iron Man was. Understandable, as this was only his third appearance in what is still an anthology book. Of course, that means the story as a whole plods along a little too slowly. But as Iron Man proves to be commercially successful, the need to explain who he is every single issue will fade away. Iron Man won’t get really good for a few more issues, when he finally gets some regular supporting characters and his armor is re-designed into something more visually interesting. But he’s getting there. A forger and counterfeiter named Wilhelm Van Vile (that’s a great name) stumbles across some magic paint left behind on Earth by aliens. Anything he paints—no matter how bizarre--will become real and be under his telepathic control. Van Vile doesn’t like the Human Torch, who once sent him to prison. So he uses painted monsters, dangerous landscapes, traps and even a painted evil Fantastic Four to try to do in Johnny. But Johnny gets a chance to use some of the paint himself, turning the tables on Van Vile. This isn’t as fun as last month’s battle against Namor, but Jack Kirby’s back doing the art work and manages to make everything look pretty cool. And, as I said, Wilhelm Van Vile is a great name for a villain. It’s also worth mentioning that this month saw the premiere of Sgt. Fury and the Howling Commandos, Lee and Kirby’s Second World War-themed adventure comic. Since Nick Fury would soon be playing a key part in the contemporary Marvel Universe, we should take note of his first appearance. That’s it for May 1963. Next month, both Iron Man and Thor run up against super-powered Commies; the Fantastic Four adds yet villain to their Rogue’s Gallery; Ant Man gets a cute new partner; and Johnny Storm literally opens up Pandora’s Box.